Recently I attended a meeting at the British Antarctic Survey building in Cambridge. 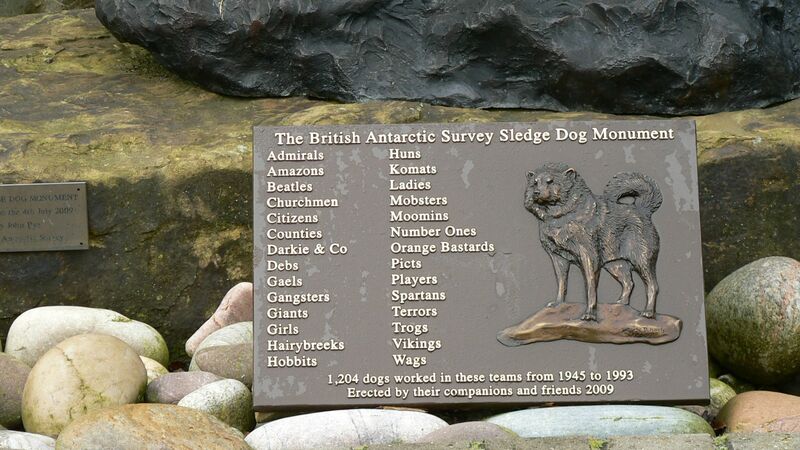 Outside the main entrance is a memorial to the dogs that worked for the Survey from 1945 to 1993. For me the list of names is found poetry. I can imagine them being recited with the sounds of barking dogs and hissing antarctic winds in the background. The names are so evocative: Hairybreeks and Hobbits are friendly, but would I want to meet Terrors or Gangsters? I’d love to shake paws with a dog called Moomin, even though I don’t know what his name means. There’s quite a bit of poetry about huskies on the web. One called My Husky Team about a race to the Pole has a ballad-like start and an amusing ending. with Peary to the Pole. Another that I like is on a site called Dogster. It starts with a statement of the achievement of the Siberian huskies. I don’t have the names of either of these poets, but I admire their work and their praise, amusing and serious, for the husky.